Riders of normal bicycles, powered by human muscles alone. These participants had the best score, achieving relatively low BMI. Pedestrians were in second place. Walking is beneficial for the body, but walked journeys tend to be extremely short due to the time taken to cover distance so this limits the overall benefit. Users of public transport came in third. Almost all users of public transport get exercise walking to bus stops or train stations. Motor cyclists score similarly to people who use public transport. Riders of e-bikes came in second to last. Drivers of cars took the last place, with the highest BMI. in so little effort possible being required from the rider. It was noted by the researchers that walking or running even to a bus stop burns more calories than hopping onto a bike with a motor immediately outside the door. This is why even travelling on public transport gave more exercise than an e-bike. Participants who swapped from driving to cycling during the study lost weight. For men, this weight was loss averaged 0.75 kg while women lost a little less. 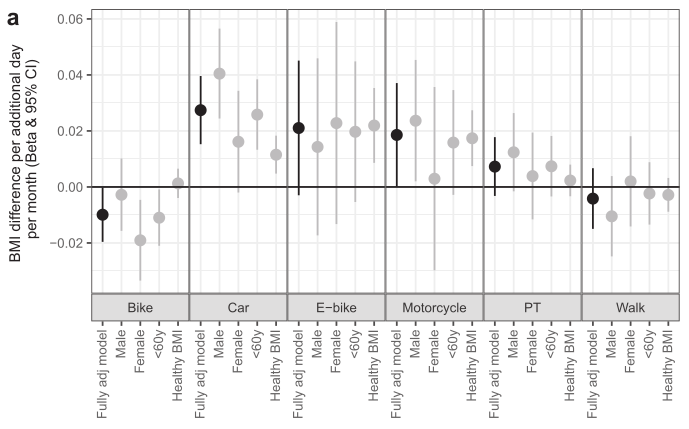 On the other hand, the BMI outcome for e-bike riders, motorcyclists and car drivers in this study is extremely close. Using a motorised mode of transport does not give a health benefit. E-bikes can genuinely be of assistance for people who are less active due to age or health problems as they allow those people to remain more mobile than might be the case without a motor, but it shouldn't be a surprise that the health benefits of cycling disappear if you fit a motor to a bicycle. The exercise benefits of pedalling are lost when you're no longer pushing the pedals hard. If you're a healthy and able human then an e-bike is as bad for your health as any other motorized vehicle such as a motorbike or a car. We each need to exercise on the order of 30 minutes a day just to get enough exercise to remain healthy. On a human powered bicycle that equates to riding around 5000 km a year. This blog post does nothing but report on the study linked at the top. The scope of the study was changes in BMI due to using different modes of transport and the resulting personal health benefits, if any, which resulted. A few people have responded by telling me that they exercise while riding their e-bike. That's great but it has nothing much to do with the study. Neither the study authors or myself ever claimed that it was impossible to exercise while riding an e-bike. 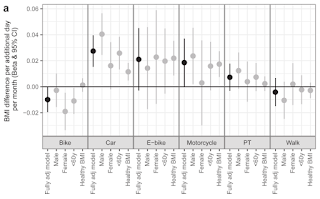 This relatively long term study suggests that, on average when considering thousands of people's behaviour, those who choose an e-bike to make their journeys do not get significant exercise while those who ride human powered bicycles do get significant exercise. Other effects such as local air pollution or CO2 footprint of different modes of transport are beyond the scope of the study. Several people have criticized my use of the term "health benefits" in the title of this piece as if this didn't come from the study itself. In fact, it was taken directly from the conclusion at the end of the abstract: "Conclusions: Our analyses showed that people lower their BMI when starting or increasing cycling, demonstrating the health benefits of active mobility." It's quite clear that being active is the key. Also note that "cycling" in this case refers to human powered bicycles. The same health benefit was not found for riding an e-bike and the inference is that many people who ride e-bikes are significantly less active than those who ride normal bicycles. The type of e-bike which the study refers to is a 25 km/h maximum assisted speed pedelec. Anything else is not a legal e-bike and would fall outside the scope of the study. You have to turn the pedals to make the assistance work on these, but you don't necessarily have to push the pedals very hard so it is possible to select top gear and do the minimum of work. workout to be had even on an unassisted bike at 12 km/h. You get less exercise if going barely faster with a motor. Why does rider health not always benefit from riding an e-bike? We can only speculate on this subject because there is no data. I suggest that it comes down to habit as much as anything else. In the past people have suggested changes of behaviour such as that drivers of cars could improve their health by, for example, parking their cars one km from work and running the last kilometre. A few people might do things like this, but the majority of car commuters drive all the way to their place of work as that is most convenient for them. I suggest a similar situation arises with e-bike riders: i.e. many could well begin with the intention of pushing the pedals harder, but they slowly find that it makes little difference to their journey time whether they work hard or let the battery do the work so it's easy to fall into doing less. 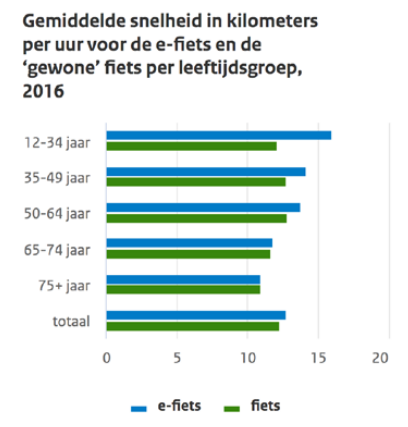 There are many e-bikes in the Netherlands and it is clear from watching how people ride these bikes that very many riders take the option of riding with an extremely low cadence in top gear and letting the motor take the strain. That the speeds of e-bikes are barely greater than the speeds of unassisted bikes supports this argument. Dutch children have historically scored well for low obesity and good well-being in comparison with children from other nations. This comes in no small part due to the exercise of everyday cycling, to school and back, to visit friends and for other purposes. School children are increasingly using e-bikes are increasingly being given to school children, and manufacturers have been happy to push this demand, providing lower cost e-bikes for children (from €1200) and some manufacturers have gone as far as to suggest that the majority of children will have electric bikes within a few years. A child who is barely pushing the pedals will not get as much exercise as his classmates who provide all their own energy. I am not the first person to note that the relatively good fitness of Dutch people could be undermined by e-bikes. Am I some kind of anti e-bike monster ? Some of the more bizarre responses which I've received have suggested that I'm either part of the car lobby or that I'm part of the bicycle lobby. Neither is the case. I've simply told you the result of a study. electric mopeds limited to 25 km/h. In rural areas they are joined by similar classes of electric and internal combustion engine vehicles limited to 40 km/h. All these vehicles have been getting along quite well for a long time in the Netherlands. I don't personally want an e-bike because it would not benefit me, but it doesn't concern me at all that other people ride them. That's their choice. 25 km/h e-bikes have a similar effect on other users of cycle-paths to 25 km/h mopeds, especially the electric versions which don't produce air pollution or noise. i.e. they don't cause a significant problem to other users of cycle-paths. Your laws on e-bikes may be different. That's beyond the scope of this blog post and the study. Isn't it the same as gearing/aerodynamic improvements/lighter components on a normal bike? It's a popular line of argument to suggest that someone who is perceived as being "against" e-bikes would also argue against other improvements to bicycles. This is not a logical argument. Any improvement to a bicycle which improves its efficiency will indeed allow the rider to travel a little further and/or faster for the same effort, but all the energy required to power that bicycle will still come from the rider. Adding a motor to a bicycle has a very different effect: It makes pedaling to some extent optional. A modern pedelec requires the rider to turn the pedals, but it does not require them to push the pedals with any significant force. In the Netherlands there are hundreds of thousands of e-bikes. They are not used to travel significantly faster than non-assisted bikes, their riders just do less work. People who switch to an e-bike almost always get less exercise as a result. No-one ever says "since I added an aerodynamic seat-post to my racing bike I've been able to ride to work without sweating", but plenty of people will tell you that their e-bike allows them to reach their destination without working up a sweat. That is made possible because the motor did the vast majority of the work. Ever since the invention of bicycles, people have added motors to them to increase speed or reduce the effort required of the rider. You can see this even from the etymology of words such as motorbike, moped, pedelec, e-bike, bromfiets, snorfiets. 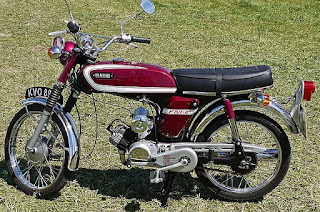 Several of these types of motorized bicycles have pedals. How often do you see someone actually pedal a moped ? Often these pedals are designed only to meet a legal requirement to have pedals. It's actually easier not to bother with them. 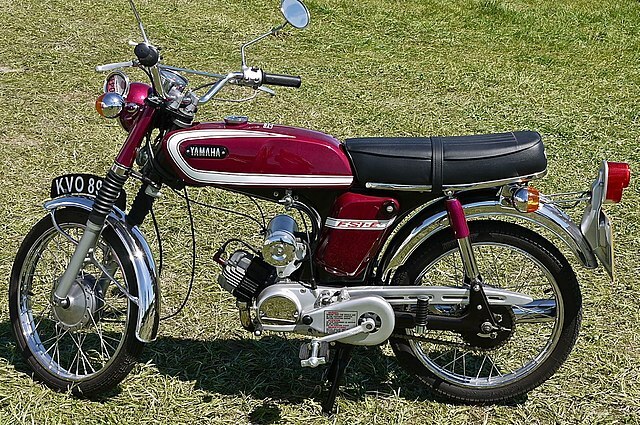 People who buy mopeds intend to use them as powered vehicles. The same is largely true for e-bikes. While it is possible to exercise on an e-bike, many owners use their electrically assisted bikes as if they are small motorbikes, putting in the minimum effort required to turn the pedals so that the motor operates. Manufacturers of e-bikes regularly claim that by riding an e-bike you can make your journey while sweating less than you would if riding a human powered bicycle. This is always an indication that you will exercise less because you are required to put less energy through the pedals. A study sponsored by Shimano, a manufacturer of e-bike motors, lists amongst other results that the average rider produced only 1/3rd as much sweat, that their heart rate was lower by 63 beats per minute and that their body temperature was raised 0.9 C less by riding an e-bike rather than cycling. These things are presented as a positive outcome, but they're all actually indicators of how much exercise is taken away from the rider if they use an e-bike rather than a human powered bicycle. See also my previous blog post about how pushing e-bikes won't result in mass cycling. The benefits for individuals and society that result from mass cycling come about when safe infrastructure is provided which encourages cycling. The answer is not a different type of bike, especially not one which doesn't require the user to push the pedals hard to make progress.